WAIST HIGH: Arnold: Oregonians Say "Piss Off!" Arnold: Oregonians Say "Piss Off!" (koin.com) Arnold Schwarzenegger Wants You To Move To Calif.
PORTLAND -- California is unveiling a campaign to get Oregonians to the Golden State. High above Fourth Avenue in southwest Portland, Gov. Arnold Schwarzenegger gazes down at motorists. 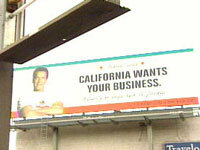 The giant sign encourages Oregonians to find work in California. Some people told KOIN News 6 that the ad is enterprising. Others said it was disturbing. The Schwarzenegger billboards are posted in 10 high-profile locations throughout the country, including Boston, Chicago and Dallas.